Exercise in the outdoors on a fun and social weekend with two guided walks round some of the most spectacular scenery the UK has to offer!. Beat the price increase. Glan Dwr Mountain Lodge in Snowdonia, North Wales, The lodge is located in Capel Curig, Betws-y-coed LL24 0EN, and easy access from the A5. If you need a lift we will arrange a suitable car share. ONLY 2 PLACES LEFT SO BOOK NOW FOR A CRACKER OF A WEEKEND! We understand money's tight, so beat the January blues by getting away on this fantastic value for money weekend. We give you the great accommodation, walks, breaky and packed lunches all for a no brainer £89! Hurry as will sell out quick! Exercise in the outdoors on a fun and social weekend with two guided walks round some of the most spectacular scenery the UK has to offer! 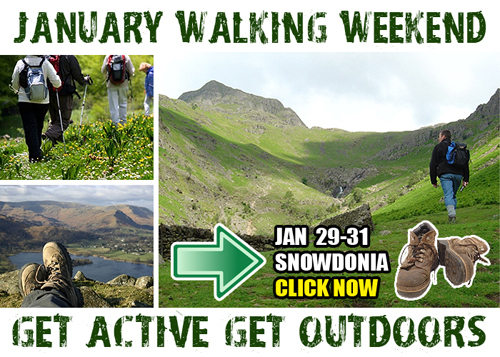 Overview: 3 days, 2 nights Walking Weekend 29th - 31st January with self contained en-suite accommodation. We will have an open coal fire for our hot mulled wine that help take away any chills. View accommodation here. Welcome get together with dinner around 8pm at the local pub. Leave the cars, we set off from our accommodation, this lovely 9 mile walk will show you what beauty is on your doorstep. Fantastic scenery and lovely people to take it all in with. We know it's easy to go walking yourself but its so much more social with a like-minded group. We will be eating at the lovely local restaurant, where your guaranteed quality. After a lazy start reading the papers and having had breakfast we will set off a few miles up the road to the Ogwen Valley for five mile circular walk around lake Idwal. Taking in the spectacular sights of the Glyderau and Carneddau mountain ranges. Accommodation: Nestled amongst spectacular scenery, between a river and a network of mountain footpaths, the lodge is uniquely positioned for outdoor enthusiasts. It has a patio area with fantastic views overlooking a mountain river and waterfall, a large drying room and a welcoming living room with fantastic waterfall views and real fire, perfect for cosying up in after our walk! The Mountain Lodge is comfortable for group accommodation with ensuite shower and toilet in each bedroom, view here. Book a place and recharge your batteries during a relaxing and revitalising short break. This weekend will improve your health and wellbeing. By becoming more active you will have a great sense of achievement, more energy, sleep better and reduce your stress levels. Please note the planned walks are dependent on local conditions and the itinerary may change due to weather conditions on the weekend. Rest assured though that we will still find walks to suit the conditions and provide you with a fun packed social weekend.